The team at Kerhoulas Dental in Mississauga believes that good oral health starts in childhood. We offer many dental services for children including cavity control, space maintainers, sports guards and more. It is so important for your children to have a positive experience at the dentist. It is our goal to ensure that at each and every appointment, we help them, and you, feel at ease. We offer a number of dental services for children including oral hygiene (cleaning), and fluoride and dental re-mineralizing treatments. We will take extra special care when introducing children to the dentist’s chair because we know how important it is for them to feel comfortable. The experience begins before their first appointment. We take the time to give them a V.I.P. (Very Important Patient) Tour of our office. We’ll treat them to a ride in the dental chair and give them an up-close look at how some of the 'cool' equipment works. When your child is ready – we will proceed with their appointment. If they’re feeling anxious or scared – we’ll simply reschedule for another time. During their appointment, our dental hygienists will help educate you and your child on the best at-home practices for oral health. Good dental habits begin in childhood. Ideally, your children should visit our practice for their first dental checkup by the time they are two years old or, if you have any concerns, earlier. Every child under the age of 12 with no cavities at their dental hygiene appointment has a chance to be entered into the Build-A-Bear Cavity Free Club at Kerhoulas Dental. Don't forget to brush and floss daily! Bring your child to visit us at Kerhoulas Dental in Mississauga. 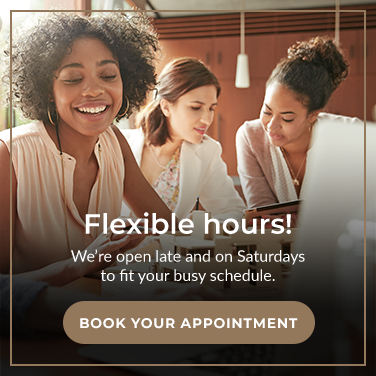 Contact our team to book an appointment today.